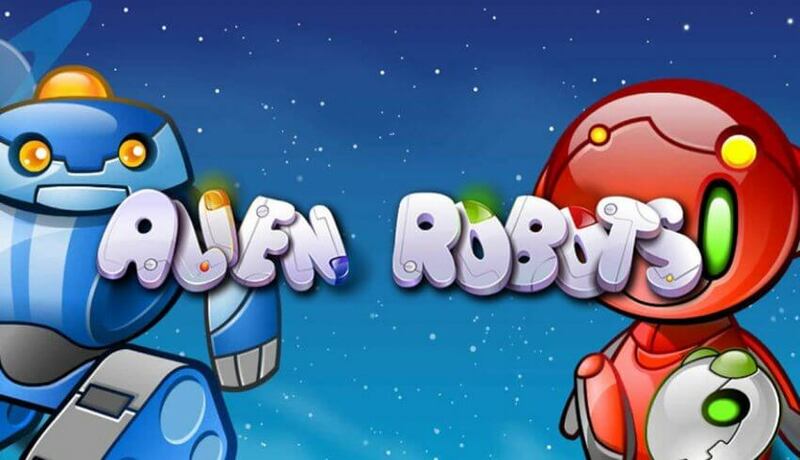 Alien Robots is a NetEnt Casino creation and features 243 ways to win, free spins and an expanding sticky wild symbol as well as wild joker symbols. Alien Robots is an online video slot with 30 paylines, 15 reels and 3 rows. The theoretic payout of the game is 96%. Alien Robots is compatible with Windows, Linux and Mac as well as iOS and android. Players can start with a low bet and move up to activating all 30 paylines and then play 243 bet ways. Players can win on paylines and bet ways. If players play between 1 and 30 paylines they will only win on the activated lines, but if they double their bet above 30 paylines the 243 ways is activated as well as the 30 paylines. For possible winning combinations players can view the paytable by pressing the paytable button. The speaker allows players to turn the sound on or off and the question mark will open the help menu. The auto button allows players to select the number of spins they would like to play by spinning the reels automatically and players can choose when they would like this feature to stop by pressing the stop button. The wrench is to adjust sound effects, ambience sound and to view game history. Alien Robots offers players more ways to win with its 243 bet ways as well as a chance to win free spins during the free spins bonus round. This is a fun and colourful online real slots NZ, which can be enjoyed by all players. A range of Alien Robots are the featured symbols with the red alien offering the highest payout of 10 000 coins for 5 and a win of 1500 coins for 5 if playing bet ways. The other 4 aliens each offer payouts of between 5000 and 500 coins for 5. The highest win for each active payline and bet way will be paid out. In order for a win the symbols must be in succession from left to right. The playing card symbols, Ace, King, Queen, Jack and Ten are featured and offer payouts of between 300 and 150 coins for 5 for paylines and between 120 and 75 coins for 5 for bet ways. The wild symbol is an alien robot with the word wild and will substitute for all the symbols except the scatter. The scatter symbol is the spaceship taking off and 3 or more of these will trigger the free spins round. For 3 scatter symbols players will receive 10 free spins, 4 scatters 20 free spins and 5 scatters 50 free spins. If 3 or more symbols appear during the free spins round players will be given extra free spins. The wild joker symbol has the ability to replace all of the symbols except the scatter. Wild symbols that appear during the free spins round will activate the sticky wild feature. The sticky wild symbols will expand and cover the reel and will remain in that position as the other reels respin allowing for the chance of more wins. The expanded sticky wild symbols will go back to being a wild symbol after a respin.